Celebrating Over 15 Years on the Web! By 1989, the Avengers had been around for over 25 years and the West Coast branch had been established for over 4 years. It was time for the mid-west to get some protectors... even if they weren't of the same caliber as the other teams. Enter: the Great Lakes Avengers! The team consists of Mr. Immortal (team leader), Doorman, Flatman, Big Bertha, and Dinah Soar and has made a few appearances here and there since they were introduced twenty-one years ago. They might not be card-carrying Avengers and they might not have their own Avengers Quinjet or Avengers Mansion, but they get an E for effort! 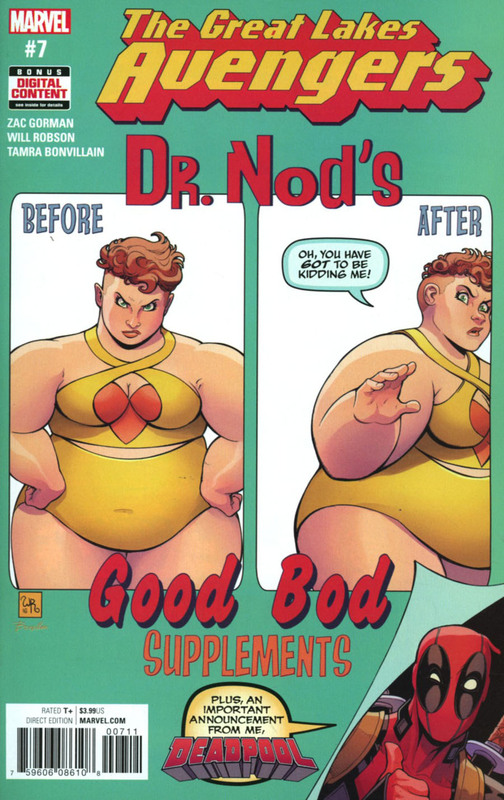 •Join us for the thrilling finale of Dr. Nod and the Bod Squad vs. The Great Lakes Avengers! •Watch as Big Bertha finally picks on someone her own size! Cringe as Flatman tries to lead the team! •Recoil in horror as Mr. Immortal wrestles a gallbladder bigger than himself! •Plus, at least TWO FULL PANELS guest-starring Deadpool or your money back! Great Lakes Avengers, Lightning Rods, Mr. Immortal, Doorman, Big Bertha, Dinah Soar, Flatman, Avengers, West Coast Avengers, Thunderbolts, Hawkeye, Mockingbird, Deadpool and the distinctive likenesses thereof are Trademarks of Marvel Characters, Inc. and are used with permission. Copyright © 1961-2018 Marvel Characters, Inc. All Rights Reserved.